The Avalanche Mountain Preserve comprises 300 plus acres of woodland located on the southern border of Boyne City, Michigan in Charlevoix County and extends beyond the City limits into Wilson Township. The area is a predominantly sloping terrain with approximately 90% of the park wooded. The area offers many types of recreational activities including hiking, biking, skiing, skating, jogging and snowmobiling and the newest additions, an archery range and disc golf. Maintenance and planning for the future of the park are the responsibilities of the Boyne City Parks Department and the Boyne City Parks and Recreation Commission, respectively. Donations for the maintenance and future development of the park are accepted through the City Manager. If you are interested, please contact the City at (231)582-6597. Avalanche Overlook/Hiking Trails - There are 462 steps to the top of Avalanche with a platform available to view the City and Lake Charlevoix. Don't worry, there are benches along the way if you need to catch your breath! Also available are trails for hiking or snowshoeing. 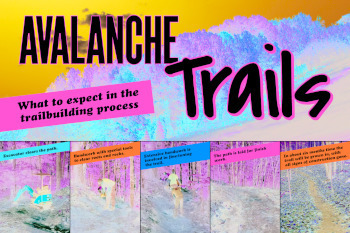 Refer to the Avalanche Trail map. The City of Boyne City, partnering with the Top of Michigan Mountain Bike Association (TOMMBA) and the International Mountain Bike Association (IMBA), is installing new riding trails at Avalanche using best practices to avoid erosion, conflict with other users and being environmentally conscience of our treasured nature area. Professionals have been brought in to design the overall trail system and experienced trail builders will be on site working with volunteers to install the trails. The goal is to provide various trail routes that are well signed so all levels of riders from near and far can enjoy what we have to offer. Mature tree clearing is not a part of the trail project; however, saplings and underbrush may be removed. Phase 1 construction will begin in September of 2016. Copyright©2019 City of Boyne City - Produced by Gaslight Media, All Rights Reserved.